RUSTPROOF QUALITY CHAINS: This ball chains are made from solid metal with nicke plated, tough, do not break; And they are rustproof, durable and practical for many industries. The ball bead are at uniform size and with smooth surface, give you comfortable feeling when hold it. ADJUSTABLE AS YOUR NEED: Each chain attaches a matching connector, use connector to form handle or extend chain. The length is adjustable, just simply cut between the balls with scissors for your need. Easy and convenient to use. VARIOUS APPLICATION:These ball chains are used for ornaments decoration chain, sweater chain, tag chain,key ring chain, bracelet string, clothing accessories, body chain harness,DIY craft creation,etc. It is widely used in daily life. 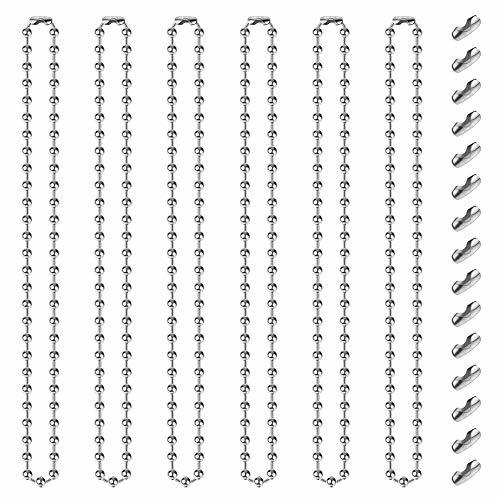 ITEM SPECIFICARTIONS:The chain length approx 24 inches(60cm), bead diameter 2.4mm; Package include 100pcs of silver ball chains and 100pcs extra jump connectors. Durable for long time using. ENJOY DIY MAKING: It is great to make fun for DIY your own ornaments and decoration your hand-make crafts. It will be full of sincerity to make a wonderful gift for your friends and family. We provide extra 100pcs jump connectors, perfect for DIY art crafts. These 24 inch ball bead chains have many uses!